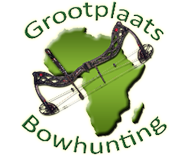 Grootplaats Bowhunting Ranch is located in sunny South Africa, where the sun always shines and the birds are always chirping. Well, thats what our tourism association say when you ask them. 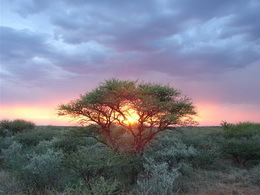 Grootplaats is located centrally in South Africa, where we have sunshine in abundance, thorntrees and savannah grass and inspiring sunsets. 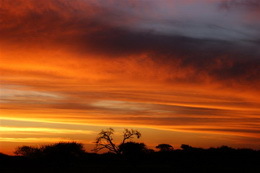 Located in the North-West province, close the Northern-Cape province, our nearest airport is located at KIMBERLEY, about an hour's drive away. BLOEMFONTEIN Airport is about 2 hours away by road. These are domestic airports, for inter-connecting flights to and from our international gateways. O.R. 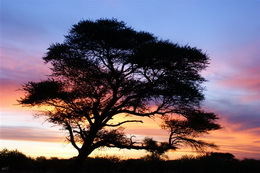 Thambo Airport in JOHANNESBURG is about 4 hours drive away and is our main gateway to the rest of the world. CAPE TOWN International Airport is several hours away, but should you enter South Africa from there, it is advisable to take a domestic flight to either Bloemfontein (capital city of the Free State province) or to Kimberley (famous Diamond City and capital of the Northern cape) situated on the border of the North-West and Northen Cape Province, South Africa. Driving from any of the airports or adjacent cities or towns, you have tarred roads upto the entrance of the ranch, and then a few kilometers well kept gravel roads. We have well-known vehicle rental companies available should you wish to drive yourself around. We will however with the greatest of pleasure, be your shuttle to our Ranch and after your magnificent hunt, take you back to the airport. We are located in a malaria FREE area of the country, but should you wish to travel to or visit some other areas, it is advisable to get your shots beforehand. We do have mosquitos in the summer, but they are not disease-carrying at all. When going on a hunt, you will be in the veld, so there is a very minor risk of ticks, but we will advise you of all sensible precautions to take.